Ametco's Perforated Metal Railing infill panels are manufactured with round, square or slotted perforations in steel, aluminum and stainless. Perforated metal railings can provide a wide range of "open air" configurations depending on your needs. To better understand these options, use Ametco's Open Area calculator to specify your railing panels. The availability of perforated steel, aluminum, stainless steel or plastic as well as the wide range of open area configurations increases your railing options. Perforations not only reduce the weight of the panels, but also permit you to control the airflow, amount of visibility and sound levels at a location. The Concord Design aluminum perforated railing is a formed .125” thick aluminum panel with a maximum width of 48” and height of up to 120”. Each panel is custom perforated with round, square, or slotted perforation. The round perforation can range in size from 1/8” to 4”, the square perforations can range in size from 1/4” to 3” and the slotted perforations can range from 1/8” x 1” to 2” x 4” in either round or square ended perforations. The Breeze Design aluminum perforated railing is .080” thick perforated aluminum sheet. The Breeze Design has V-shaped stabilizing folds running the width of the panel to provide strength without any increase in the visual screening. The maximum width of the Breeze Design panel is 60” with a maximum height of 120”. Each panel is custom perforated with round, square, or slotted perforation. The round perforation can range in size from 1/8” to 4”, the square perforations can range in size from 1/4” to 3” and the slotted perforations can range from 1/8” x 1” to 2” x 4” in either round or square ended perforations. 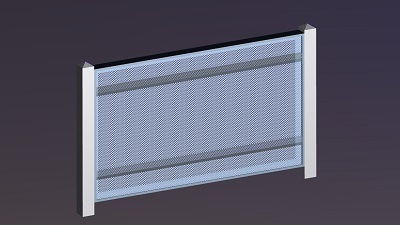 The Delta Design aluminum perforated railing is a .080” thick perforated aluminum sheet. The Delta Design has aluminum louvers on 12” centers running the width of the panel to provide strength and beauty. The maximum panel width is 60” with a maximum height of 120” The distance between louvers can vary to increase or decrease the percent of direct visual screening. Each panel is custom perforated with round, square, or slotted perforation. The round perforation can range in size from 1/8” to 4”, the square perforations can range in size from 1/4” to 3” and the slotted perforations can range from 1/8” x 1” to 2” x 4” in either round or square ended perforations. 8 page PDF: Download to review panel and top rail options as well as applications, configurations, mounting and installation.